Do you share other people’s Instagram posts to your own account? Concerned you may be violating Instagram’s terms of service or copyright law? 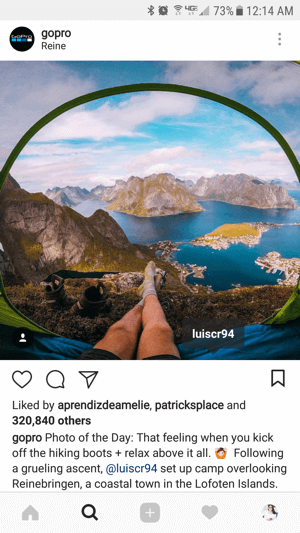 In this article, you’ll discover best practices to help you safely and legally regram other people’s content on Instagram. 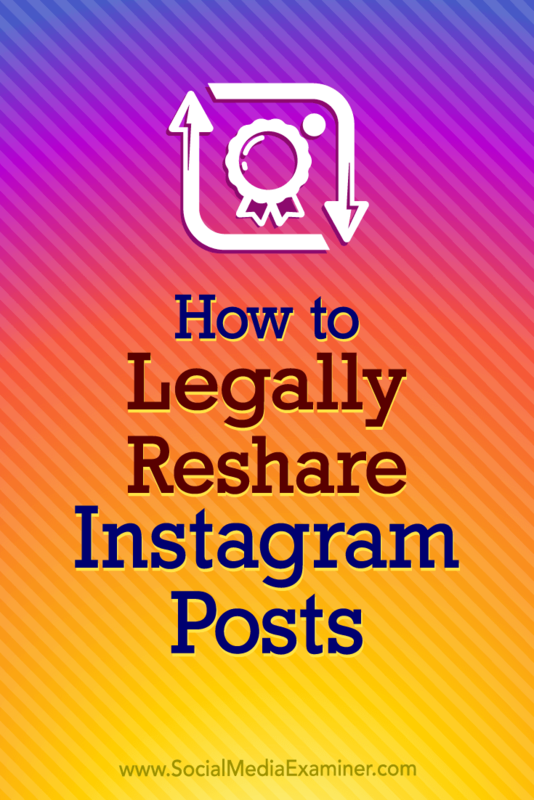 How to Legally Reshare Instagram Posts by Jenn Herman on Social Media Examiner. All good marketers and business owners want to abide by the rules and terms of service for social media platforms. And because Instagram doesn’t include the ability to regram directly within the app, many people have feared that this practice of sharing other people’s content is actually a violation of the Instagram terms of service (TOS). In fact, there previously was a statement in the Instagram terms of service (TOS) that said sharing content other than your own was a violation of the platform’s terms. This meant regramming was a violation. Instagram has, however, updated their TOS to state that you’re responsible for any content you post on Instagram. Sections 7 and 8 speak directly to the types of content you’re responsible for. You can read the most current version of Instagram’s terms here. In layman’s terms, Instagram is saying that you’re responsible for the proper use of any content you share on the platform. If you share content you didn’t create, you’re responsible for ensuring you have the appropriate permission to use that content on your profile. As long as you have permission from the original content creator, Instagram has no concern with what you’re posting and you won’t risk your account being in violation of their TOS for this type of content. Instagram’s TOS outline content responsibility. 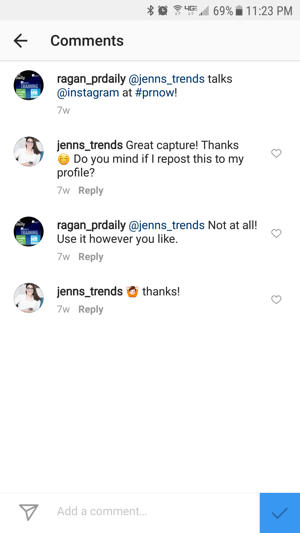 This article talks about Instagram, but it’s worth noting that these practices can apply to all social media or content resharing in any capacity. The biggest issue with sharing someone else’s content is the copyright ownership. The person who created the post content owns the copyright and therefore owns the right to any revenue or benefits afforded by that content. As a brand or business, this can be used against you legally if you don’t have the waiver of copyright protection from the original post creator. For example, if you shared someone’s post that displayed your product, and in that post caption, you advertised a sale or made a comment that the product is available on your website, legally the revenue generated from the post can be attributed to that content. If you don’t have permission to use that content, the original post creator could sue you for that corresponding revenue. This is a worst-case scenario and most people would never go to those lengths. But it can, and does, happen. Most of the time, though, if you infringe on someone’s copyright, you may simply receive a request to remove the content or even a cease and desist order. Either way, you can avoid these situations if you take the proper steps to protect yourself. Getting consent to use someone’s post can fall into some gray areas so I’d like to clarify those for you here. There are two types of consent: implied and explicit. Implied consent is when users post content with the expectation that it may be regrammed. Swatch asks users to tag their posts with #MySwatch for a chance to be featured on their Instagram account. For instance, suppose you run a campaign and encourage customers to use a unique branded hashtag. You specify in the campaign details that using this hashtag may get the post featured on your Instagram account. When people post relevant content using that hashtag, it’s implied that they’re providing their consent for you to use their post on your Instagram account. Of course, the challenge with implied consent is that it’s not a formal release of copyright or permission to use the content. While you may typically be safe from legal exposure when relying on implied consent, the best type of consent is explicit consent. Explicit consent is where the original content creator gives you direct permission to repost their content on your Instagram account. You can get this written permission in a variety of ways. Often the fastest and easiest way to get permission from someone is to post a comment directly on their post, asking permission to repost it. Your comment doesn’t have to be long or technical. Here’s an example of a simple request for permission, followed by the original user’s explicit permission. Ask permission to regram using a comment on the original post. Once the original user has given you permission to use their post, you’re free to regram it to your account. If you’d prefer to keep your request for permission more private, you can send a direct message to the original user asking for permission, rather than posting a comment on their original post. To ensure there’s no confusion about the image you’re asking to use, send the image directly to the user as the direct message. To do this, go to the post on their account and tap the direct message button (the icon that looks like a paper plane). Then type in the name of the account (yes, you’re sending them their own post) and write your short message asking for permission to use the post. 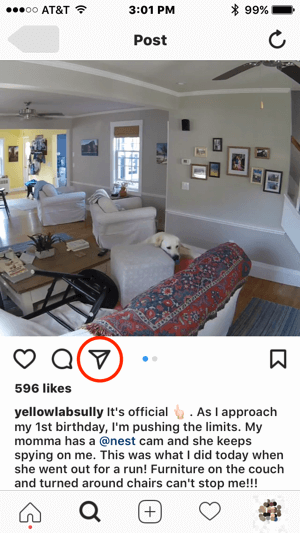 If Nest wanted to contact this Instagram user for permission to use their content, they could initiate communication by tapping the direct message icon. Once the original user has responded to your direct message and given you permission to use their content, you’re free to regram it to your account. When you team up with a brand ambassador or influencer to specifically create content that showcases your brand, the expectation is that you’ll use the content on your account. If this isn’t spelled out in a contract, however, the same copyright laws protect the original content creator. Whenever you work with another person directly to create content that you’ll want to repurpose, be sure to include copyright waivers in your contract with them. The Repost for Instagram app (available for Android and iOS) is the most common app used to reshare content on Instagram. As long as you have prior permission to use someone’s post, using this app (or another repost app) is compliant with terms of service. The Repost for Instagram app adds the creator’s Instagram handle to the image you’re resharing. The benefit of using this app is that it will add a watermark to the image with the original post creator’s Instagram username. This makes it clear that the content is regrammed and provides attribution to the original creator. You should also include the original creator’s username in your post caption to give them attribution. Some accounts prefer to share content without the watermark on the image. The watermark can detract from the composition of the post and diminish the quality of posts’ appearance on your profile. In these cases, it’s acceptable to capture the image and repost it without a watermark on the image. There are apps that do this, but you can also simply take a screenshot of the original post and crop it to the image size before resharing it to your account. As a reminder, you still require written permission to use the original content. GoPro is an example of an account that does this effectively. They post a clean image on their profile and give attribution to the original creator by both tagging them in the post and listing their username in the post caption. GoPro regrams content without a watermark but provides attribution to the original post creator. There are many social media dashboards available to help you manage your social media posting and interactions. Of those that support Instagram management, the ones that also provide regramming functions are Iconosquare, Tailwind, and Hootsuite. Again, you need to get permission to reuse the content before you utilize one of these tools to share the content. Tack is unique among the other tools listed here because it allows you to collect your written permission for use directly within the dashboard. You can search for content to easily find the posts you want to share and directly contact the post creators to ask permission. The dashboard retains all of those permissions for you. Tack offers a 14-day free trial, with paid plans starting at $99/month. 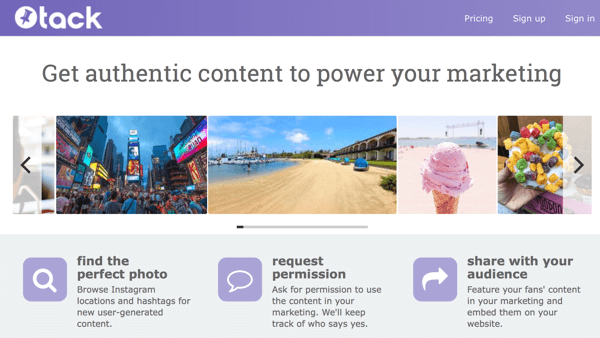 Tack allows you to source content and request permission to use it all in one location. Regramming content on Instagram can be a valuable way to showcase your business and thank your audience. It’s important, however, to take the necessary steps to protect yourself and your content on Instagram. 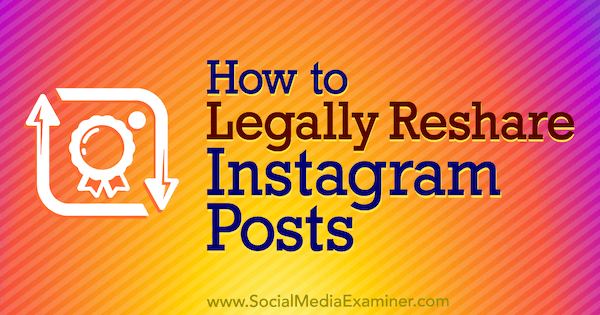 Following the steps listed in this article will help ensure you avoid any legal issues when using other people’s content on your Instagram account. What do you think? 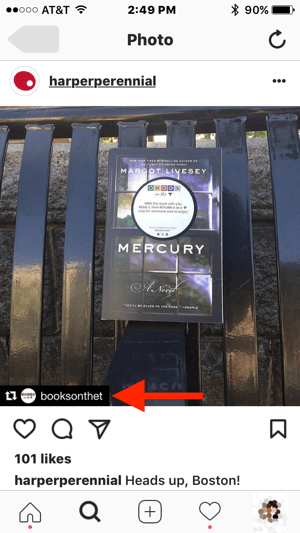 Are you going to change the way you regram? Or do you already use this practice of getting permission? Please share your thoughts or lessons learned in the comments below.